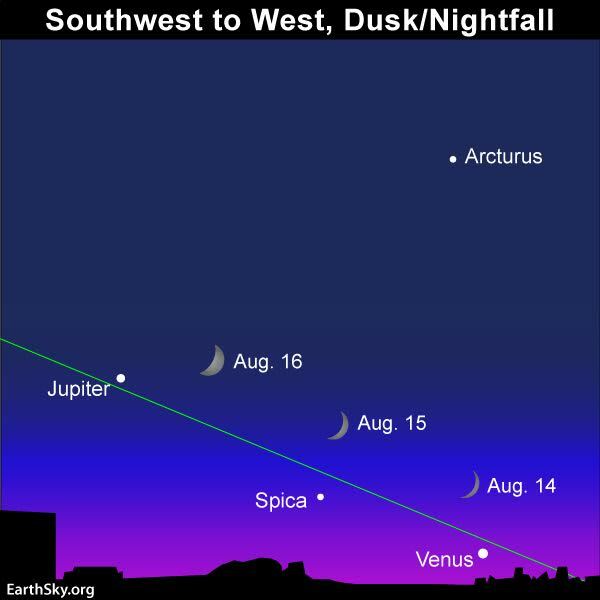 After sunset on August 14 to 16, 2018, look west to see three brilliant worlds – the moon, Venus and Jupiter – beautifying the evening twilight. Each successive evening, after sunset, watch for the waxing crescent moon to move away from Venus and closer to Jupiter. This daily eastward movement of the moon relative to the background stars and planets of the zodiac is due to the moon’s motion in orbit around Earth. There are a total of four planets in the evening sky now, and the moon will pass each one in turn. Look back at this night sky post for charts and more information, if you want to mark your calendar! 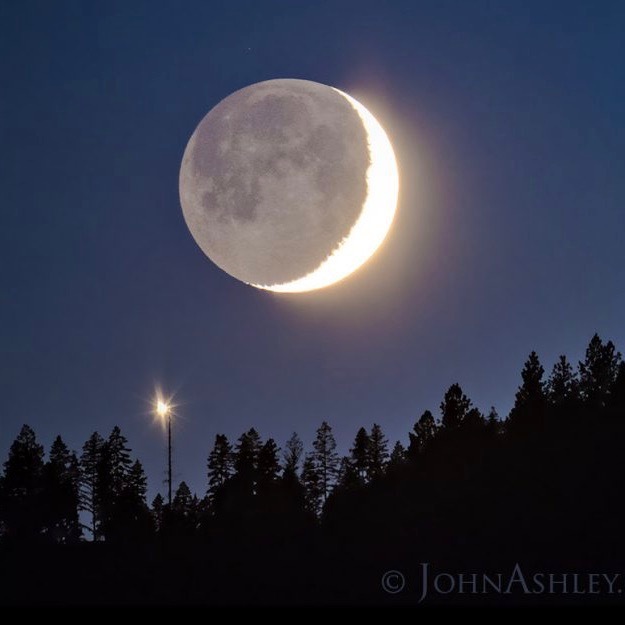 Earthshine on a crescent moon, and the planet Venus, by John Ashley in Montana. That pale glow softly illuminating the moon’s nighttime side is called earthshine. 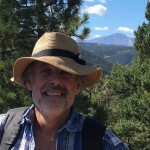 See it on John Ashley’s photo, above? Yes, that is the night side of the moon, not Earth’s shadow on the moon. Earthshine is twice-reflected sunlight, which bounces off Earth to the moon, and then back. What causes it? Realize that, from the Earth-facing side of the moon now, an almost-full Earth beams in the lunar sky. You know how a full moon can light up an earthly landscape? Likewise, a full or nearly full Earth lights up lunar terrain. In fact, a full or nearly full Earth lights up the moon’s surface even more effectively than moonlight does Earth. That’s because Earth has some 13 times the moon’s surface area. Plus, our world is three times more reflective of sunlight than the moon. Add those two facts together, and you can see why a full Earth in the moon’s sky is around 40 times brighter than a full moon in Earth’s sky. Image – to scale – via NASA. 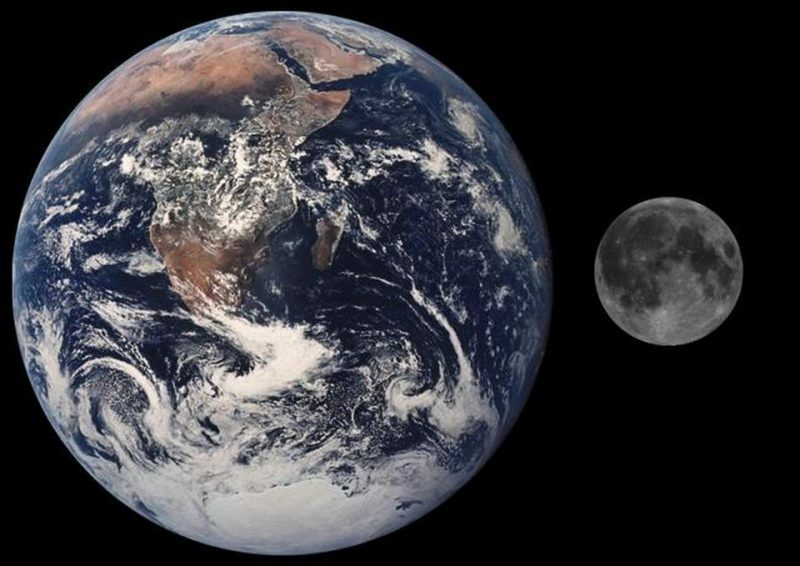 Earth is bigger and more reflective of sunlight than our moon. So Earth in the lunar sky is very bright! Now let’s talk about Venus, the brightest planet on all three of these nights, and the planet closest to the moon on August 14. When we see a moon in the west after sunset, it’s always a crescent moon that’s waxing toward full. 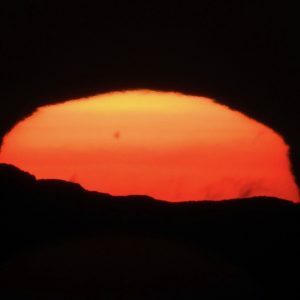 In contrast, whenever Venus first appears as an evening “star” in the west after sunset, this planet – through a telescope – always appears nearly full. It’s always a waning Venus, due to decrease in phase as the months pass. The difference is because the moon revolves around the Earth, while Venus revolves around the sun. Venus entered the evening sky (at full phase) on January 9, 2018, and will leave the evening sky (at new phase) on October 26, 2018. Venus always transitions to the evening sky at full phase and into the morning sky at new phase. 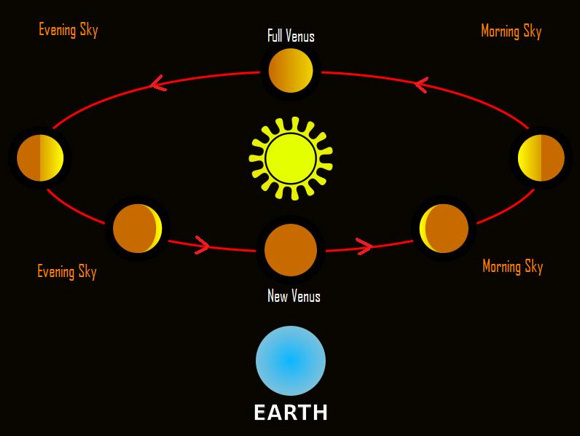 Venus and all the solar system planets go counterclockwise around the sun as seen from the north side of the solar system plane, as in this diagram. Have a telescope? These next few months present a great time to watch Venus through a telescope, as this world wanes from its half-lit waning quarter phase in mid-August to a thin waning crescent in September and October. We give you fair warning, though. Venus will be considerably easier to observe from the Southern Hemisphere where Venus is higher up in the sky at sunset. Remember, it is easier to view Venus’ phases in a twilight sky because the glare of Venus is so overwhelming after dark. A telescope is also great for watching the Galilean moons – the four major moons of Jupiter. In their order going outward from Jupiter, these moons are Io, Europa, Ganymede and Callisto. Although all of these moons are farther distant from Jupiter than our moon is from Earth, Jupiter’s moons orbit Jupiter much more swiftly than our moon orbits Earth. Because these moons are moving so quickly around Jupiter, that in itself lets astronomers know right off the bat that Jupiter is much more massive than our planet Earth. In fact, these moons enabled astronomers to figure out Jupiter’s mass. Read more: How do astronomers know Jupiter’s mass? Bottom line: Watch the grand celestial spectacle – the moon, Venus and Jupiter – on August 14 to 16, 2018. You’ll find them all by looking west after sunset.